MerchantCircle | Blog: Can Joe the Plumber Buy Newell Plumbing? Joe the Plumber may face a hurdle now that the presidential campaign has brought him to the forefront of national attention. Calls to A Newell Plumbing Repairs found off MerchantCircle went unanswered, and their voice mail box was full. Sounds like business is REALLY good - that, or a ton of journalists are calling to find out more about Joe Wurzelbacher. Joe was brought up by Senator John McCain during the third and final Presidential debate. Joe had asked Senator Barack Obama on Sunday in Holland, OH why he should be taxed more if he bought the plumbing business he currently worked at. A Newell Plumbing apparently makes more than $250,000 a year. Senator McCain's point was that no one should be taxed more during this time of economic distress. Joe's response to being America's 'average Joe'? "Pretty surreal" according to an interview he did with the Associated Press. Let's hope that he's already closing the deal on buying the business, because this attention will bring A Newell Plumbing Repair to the top of search engine queries. i don't know how it works in ohio. but in our little town of edgewater,fl they force carpet installers to form their own corporation and pay corporate tax. they only make about 50,000,so they can only afford to rent and therefore can not use their rental home as a write off. 4 years ago, they could be given a 1099. i wish one of our wonderful choices for a leader of our country,would have visited us,and look into how these guys are robbed by red tape. they are the hardest working americans,who fall apart physically by age 35 without the big payoffs our intelligent football players get after they wear out. so if joe the plumber owes taxes, i sure know why.and if he is working for a licensed plumber,leave him alone. at least he gets up everyday. a lot of people in this country only got energy once this year,and that was when they were rounded up to hop aboard the acorn bus-and voted for the first time in their life. i wonder why??? 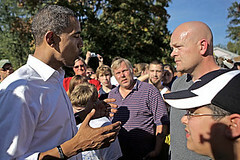 Joe the Plumber should run for President, better than the 2 running now.